When Ellie Stager made her husband Andy a seersucker bow tie out of left over fabric, she never imagined that a simple tweet of her creation would lead to the development of an in-demand line of men’s neckwear. Ellie and Andy started small by setting up a sewing studio in one of their spare bedrooms, but before they knew it, their hobby turned into a business, The Cordial Churchman. In March 2012, Ellie and her team were able to take their operation into a studio in the historic district of downtown Rock Hill, South Carolina. Today, Ellie and four other employees work together to make each bow tie a perfect reflection of a man's personality. 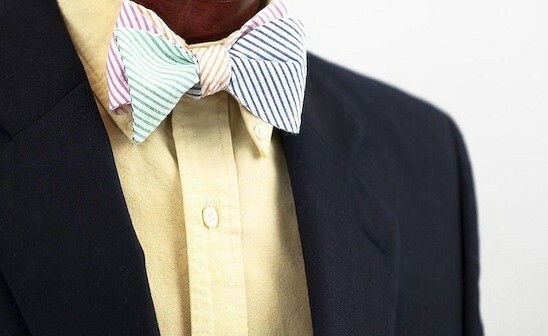 So whether you love the classic look of the chambray or are a bit bolder and love the four tone seersucker, these bow ties will leave you dressed to impress. When Ellie Stager made her husband Andy a seersucker bow tie out of left over fabric, she never imagined that a simple tweet of her creation would lead to the development of an in-demand line of men’s neckwear. Ellie and Andy started small by setting up a sewing studio in one of their spare bedrooms, but before they knew it, their hobby turned into a business, The Cordial Churchman. In March 2012, Ellie and her team were able to take their operation into a studio in the historic district of downtown Rock Hill, South Carolina. Today, Ellie and four other employees work together to make each bow tie a perfect reflection of a man's personality.